Date: Every Thursday, Beginning the 22nd Oct, 2015. Please note that there is limited space available. To sign up, email info@fresh-creations.co.uk or call 0141 941 3308. 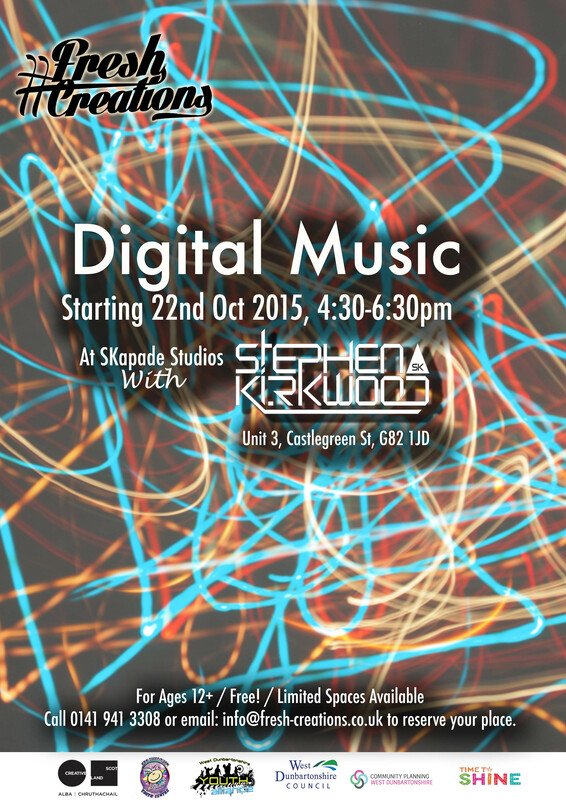 Week 1: Introduction to Dance Music Creative – Technologies and Networking. This will involve getting to know each other and getting used to the studio as a creative environment. We will discuss which creative industries we enjoy such as drama, art and music and how we can incorporate these into the music making process. This week will focus on team building and networking. We will introduce what we can do within the music industry and what will be included throughout the 10 week course. A quick look at how music is constructed, looking at the instruments and computer programs used to create music. We will jam on instruments, coming up with potential ideas for the creation of our own track. We will listen to some of the groups favourite music and learn how our favourite music is created. We will continue to build ideas and mutually decide on an idea for a musical track that we want to use. Throughout this workshop the class will learn how elements of music come together to create a finished product. Elements like kick drums, bass line, lead sounds, strings, pads, piano & percussion elements will be explained as to why they are essential in the creation of a dance music track. Work continues and the class will get a deeper understanding of the music production process. Ideas will now be developing at a consistent level and the class will have full input as to where the track heads. We will be documenting each step for a final presentation at the end of the course. This is where extra elements like vocals and effects can be added to the mix. We will learn the importance of vocals and effects and why they are essential in current dance music. We will set up a mic and the group will have the opportunity to record their voices and sounds in and around the studio to use as potential effects. This week the production process will continue. We will continue to add more musical elements, getting the sections and parts we have worked on sounding good and paying a lot of attention to the ‘mix down’ of the track. This week we will also have a guest speaker, Steven Galloni a comedian and actor holding confidence building exercises. This will incorporate how to promote yourself as an artist and how to successfully speak in front of large audiences. Week 7: Finalising The Track – How To Get Noticed! We will begin to go through the mixing process. This is where all of our individual ideas and samples are brought together through various techniques and processes into ‘the mix’. In addition, we will glance at how to get the track sounding ‘loud’ enough to compete with other dance music tracks out there. This involves a look into mastering. We will discuss how to get noticed on social media, the Do’s and Don’t’s of social media and more on public speaking. We will look at presenting a two minute presentation. We will take a look at the track and make sure it’s sounding good and begin mastering the track. We will learn how to submit your music to record labels and how to set up your own Sound Cloud pages and website. We will discuss the importance of keeping a clean profile online. Nearing the end of the project we will be now putting the finishing touches to the musical song created, as well as having a recap through all of the music production knowledge learned so far. This week we will summarize what we have learned so far in the course and compile a slideshow presentation. They will then need this slideshow as evidence of course completion and in order to obtain a Bronze Arts Award through Trinity College London. * We will put our finishing touches on the track that we’ve created and make sure its ready for the tracks showcase at the #FreshCreations club night at Desire Nightclub! *The Bronze Arts Award is optional.